(i) Burning the paint by directing the flame of a blow lamp on the painted surface and scrapping it. The method is quite suitable, quick and economical in case of iron or steel work but only expert workmen could be depended upon for its use in case of wood work. A little carelessness could leave the wood charred. (a) Hot solution of equal parts of soap, potash and quick lime is applied on the surface and kept on it for 24 hours, after which washing with hot water will remove the paint. (b) Two parts of quicklime and one part of washing soda mixed with water to the consistency of cream spread on painted surface is kept for an hour. It is then washed off with clean water to remove the paint. (c) Solution of caustic soda in water is applied to the surface. While applying caustic soda solution to the surface care should be taken of the hands. On wooden surfaces this solution should not be left long otherwise fibres of wood would be damaged. The surface should be washed well with clean water and neutralized by applying a week solution of acid or vinegar. (d) Naptha. Naptha is coated repeatedly on the painted surface till the paint becomes soft. Then it is rubbed down and the surface cleaned. Application of paint to a surface either with a brush or by spraying* is known as painting. *Spray Painting. With a spraying pistol, worked by compressed air, atomised paint is sprayed on the surface in a uniform coat. Beautiful appearance of perfection achieved by spray painting can never be achieved in painting by hand with brushes. All superior class painting work is done by spraying. The surface to be painted should be perfectly smooth, clean and dry. Iron surface to be painted should be free from rust. 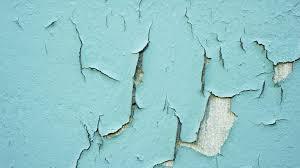 Presence of moisture between the paint and surface to be painted or between successive coats of paints causes blisters. Painting should as far as possible be carried out in dry weather. Preservative quality of paint depends upon the toughness and impermeability of the film formed by linseed oil in combination with the pigments. Everything added to it like drier, turpentine oil and inferior pigments tend to reduce its life. As such the boiled linseed oil and pigments used should be of the best possible quality and no more turpentine oil and driers should be added than found to be absolutely necessary. No coat should be applied before the previous one has dried. Brush of only good quality, the hair of which do not come off while painting, should be used.